Why not? Covering my rice noodles with a thick layer of gravy and beef slices makes me really happy. In fact, I love eating the gravy more than I love eating the noodles. This dish is made just for me. And oh, don’t forget the pickled green chillies. Heat 2 tbsp oil in wok. Add rice noodles and 5 tbsp dark soy sauce. Stir-fry continuously on high heat for about 5min. Plate up noodles and set aside. Mix beef slices with salt, sugar, white pepper and 2 tsp sesame oil. Coat evenly with corn flour and bicarbonate of soda. Leave to marinate for 30min. Heat 2 tbsp oil in wok. Stir-fry beef till almost cooked and still a bit red. Remove from wok and set aside. Heat another 2 tbsp oil in wok. Stir-fry garlic and ginger till fragrant. Add spring onions and chye sim. Stir-fry for 1 min. Add hot water, chicken stock cube, light soy sauce, 4 tbsp dark soy sauce, oyster sauce, 2 tbsp sesame oil and Shao Xing wine. Bring to a boil. Add corn flour mixture. Drizzle in egg. 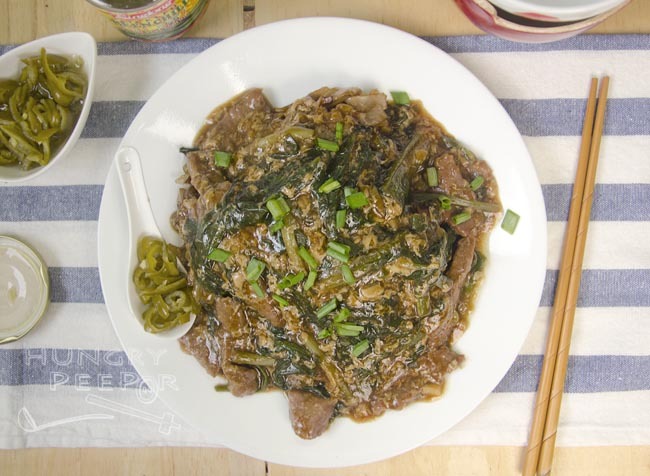 Return fried beef slices to wok. Stir-fry quickly and switch off the heat. Ladle gravy mixture over noodles. Serve with chopped spring onions and pickled green chillies. 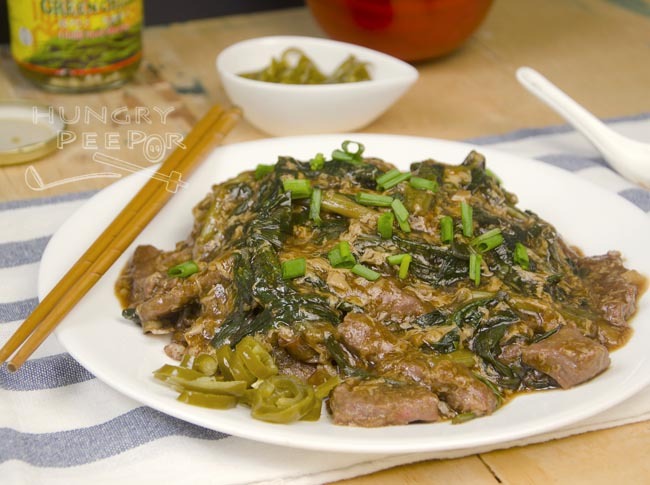 The hawker style beef hor fun uses the thicker rice noodles for this dish. I had to use the thinner 1-cm version as the thicker versions cannot be found in any supermarkets or markets. Remember to use high heat to fry the noodles to get that distinct ‘burnt wok’ taste, which is what makes this dish so fragrant! Halve the dosage of corn flour for a thinner gravy over the noodles, which is the usual way of serving this dish as well. 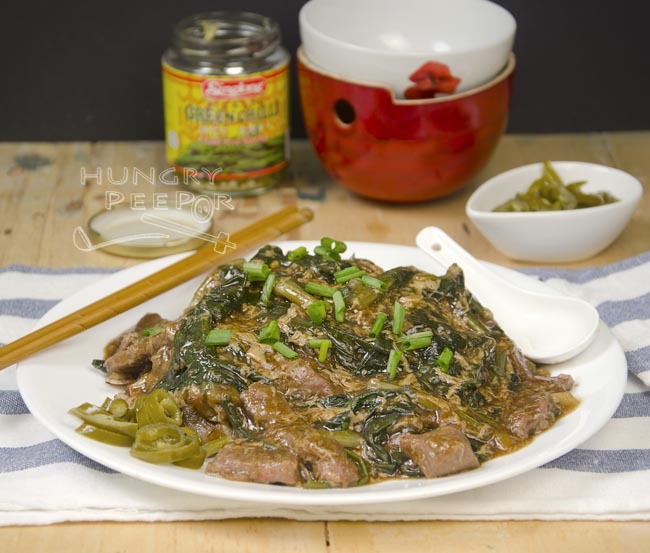 This entry was posted in Chinese, Noodles and tagged Beef, Cantonese, Rice noodle, Stir-fry. Bookmark the permalink.